If you find yourself triggered by what follows, please note that my over-riding interest here is the truth. My priority lies in assuring that we use our remaining national resources wisely; not squandering them on a monumentally stupid act like sparking a war with a major nuclear power. I’ve been completely consistent on this point over the years. 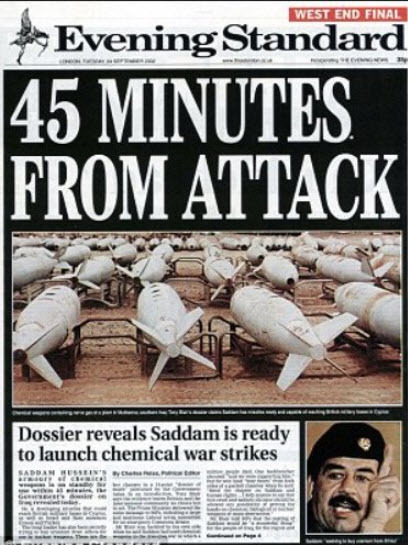 While this is an historical embarrassment, it’s critical that we remember that the vast intelligence agencies of both the US and the UK were deeply complicit in promoting the false narrative that Saddam had vast stores of chemical weapons, claiming that he was within 45 minutes of launching massive and damaging strikes against American and British targets. Of course, no such chemical weapons existed. There were no stockpiles of WMDs. The Iraqi military also had no means of delivering them, via missiles or aircraft. And more to the point, Saddam had never once threatened to do so at any point in time. But none of that mattered. Saddam was relentlessly built up as a mortal and imminent threat in the press by a vast “coalition of the willing”. Almost everything that I now read about Russia, including the emotional certainty by those delivering the news that it must be true, is precisely identical to that which accompanied the disastrous (and immoral and illegal) attack of Iraq by western powers. How can people so quickly forget this very recent and colossal blunder? Who benefits from the poisoning of the Skripals? There is no way to hide this continuous rampage against independent nations building gas pipelines to Europe. Trillions of dollars diverting from coal and nuclear generation cannot benefit when the states of Russia, Iran, Qatar, Iraq，team up to supply gas. The western nations are not welcome at their feast. That is one beneficiary of the boycott against Russia etc. Then there is Christopher Steele, in court this week, he may benefit from the elimination of an underpaid whistleblower that he paid to compile the Trump dossier. Then there is Trump in an act of revenge for same dossier. Then there is May and MI6 caught with their pants down on the dossier supporting Hillary against Trump in the US elections. Then there is the sabotage on NordStream 2 gas pipeline direct fron Russia to Germany. Of course May and UK get a double bonus blocking the NordStream as she can pay backGermany for being mean on Brexit. The latter looks likely to me. Next Post “Welcome to Hell”: Barcelona Taxi Drivers Prepare for Uber’s Return.